Immediate Openings for US-IT OPT or CPT Recruiters for Remote or Vijayawada, India. I Net Soft is looking for US-IT OPT or CPT Recruiters for Remote or Vijayawada, India. Need to know Tax Terms, Statuses, and IT Technical Terms. Need to have Laptop & Ineternet for remote. Packages: Salary, Attractive Incentives, Bonus. No, of course having cancer is not hunky-dory. But until the launch of ObamaCare came along he had insurance. Now he does not and the fact that he lives in Texas is not relevant to anything. The fact that everything was hunky-dory until the launch of ObamaCare says even more. Garth Kant is WND Washington news editor. Previously, he spent five years writing, copy-editing and producing at "CNN Headline News," three years writing, copy-editing and training writers at MSNBC, and also served several local TV newsrooms as producer, executive producer and assistant news director. He is the author of the McGraw-Hill textbook, "How to Write Television News." WASHINGTON — Hunter Alford is the happy kid next door with a big grin who idolizes country music star Blake Shelton. His parents call him a "wild, fun loving, zombie-killing boy who loves the military and police." He is normal in every way, except this 7-year-old already plays guitar and keyboards and has his heart set on learning to fiddle. Something else sets Hunter apart. He was born with a rare form of cancer and lost his health insurance just after Obamacare went into effect. Americans were told the health-care law was designed to help children just like Hunter, born with a deadly pre-existing condition and little means to pay for expensive treatments. The Affordable Care Act was not supposed to take away the insurance these most-vulnerable children already had and leave them utterly defenseless against a life-threatening disease. Answers are hard to come by, but it looks like that's what the president's signature achievement has done in the small town of Gainesville, Texas. Ron and Krista Alford's two children, Hunter and his sister, Makayla, were both born with an extremely rare form of cancer called Plexiform Hishocyne Neoplasm. The parents said their children "have known nothing other than hospitals, doctors, sickness and pain." Makayla is currently in remission, but Hunter is in the second fight of his young life against cancer. He is hospitalized and needs another round of chemotherapy, which will cost $50,000 without insurance, leaving his parents at their wit's end. Concerned individuals may contact Texas Health and Human Services ombudsman on behalf of Hunter and/or contribute to the Heroes for Hunter fund. Krista's strong Midwestern spirit was immediately evident as she described her family's dilemma to WND, but so was the fear in her trembling voice, as she carefully searched for the right words. "Why would you cancel a kid?" she asked. "I really want to send Obama and all of them pictures of my son. He has scars all over his head. He doesn't want to leave the house because he's afraid people are going to make fun of him because he's bald." The insurance company initially told Krista that Hunter's information was lost while it was making changes required under the newly implemented health-care law. Hunter was insured under the Children's Health Insurance Program in Texas, or CHIP. According to the CHIP website, "Families with children who get Children's Medicaid pay nothing and children with CHIP pay no more than $50 a year for health care coverage." Krista explained that CHIP is different from Medicaid. "With CHIP you have to pay a copay for every doctor's visit, and you've got to pay so much for prescriptions," she said. Did she have any suspicions as to why her child was dropped? She said "No" and suspected the company might be confused. "They sent me a letter asking me why Hunter was being hospitalized, and if he had been in an accident," she explained. "I sent back a letter saying that he has cancer, a very rare type of cancer, and that he is seeking chemotherapy." She hopes it is just one big bureaucratic blunder. "I can't see the government canceling him because they are paying too much for all his stuff," Krista said. "It's possible. But I can't see that happening because I figure the government makes a lot of money." When reporter Allison Harris of local KXII-TV broke the story in Gainesville and tried to contact anyone at CHIP for an explanation as to why Hunter lost his insurance, she was unsuccessful, as was WND. Harris persisted and told WND on Wednesday she had finally reached a media spokeswoman, Texas Health and Human Services Communication Director Stephanie Goodman. Even though she had not seen the specifics of Hunter's case, Goodman claimed the problem was not caused by the Affordable Care Act. However, Goodman also appeared to contradict that claim by confirming to Harris that the department has had problems as it made transfers to prepare for the new health-care law. Describing a confusing process reminiscent of the horror stories the nation has heard since the launching of Obamacare, Goodman said that those who had CHIP and Medicaid got their CHIP canceled and became insured through Medicaid, because it has greater benefits. Once Goodman located Hunter's case file she got back to Harris and, without being able to divulge details, appeared to indicate the Alfords do not meet the financial standards for CHIP. For a family of four, the cutoff is $47,100. She said the state re-evaluates family income every six months when families reapply for coverage. However, Krista told WND that Hunter had been covered for a year and a half without ever having to reapply for coverage, and she was never notified that she had to reapply for coverage. When Harris asked Goodman about cancelling Hunter's treatment in the middle of his chemotherapy, she said there are Medicaid plans, other than CHIP, that allow patients to stay covered during treatments such as chemotherapy, even if the family's income changes. That may be true, but Krista told WND she has been frustrated at every turn while trying to get coverage reinstated for Hunter. Goodman claimed again that the problem was not related to the implementation of Obamacare, but her description of what happened indicated something in the process had changed since the law went into effect. It would appear that something was what likely caused Hunter to lose his insurance. Goodman said her department (HHSC) wasn't required to, but chose to, transfer cases in preparation for the advent of Obamcare. There were some "glitches" in coverage when that happened, she said. One of the "glitches" apparently caused a little boy with cancer to lose his health insurance. From Hunter's hospital room, Krista told WND, "Each time I called there was a different story. My son was transported to the hospital on Oct. 31, and I found out his insurance was canceled on Nov. 1. That was quite a wake up call, after not being able to sleep until five in the morning." When she called CHIP the following Monday, "they said he was canceled due to his 'not requalifying.'" However, Krista said she'd had the insurance for a year-and-a-half and had never received any notice that she needed to "requalify" her children. The experience just got more bizarre from there. "She told me to hang on, then, all of a sudden could not find my son or daughter's case, at all. And then, she transferred me over to another gentleman who found their cases. He said it was hidden, because when they switched over to HHSC (Texas Health and Human Services Commission), they lost a lot of case files and Hunter's was just one of those." That gave Krista reason to hope. "He said, 'Everything looks likes fine, just let me start working on this, give me a couple of days, have patience and we'll call you.'" Is your son pregnant or an illegal? Krista said she waited and waited and no one contacted her. "I called again, and then I was told he could expedite it," she explained. "But then, I called back the next day, and the next, and, finally, the lady told me the only way to expedite it is if my son was pregnant and in labor or an illegal." "I kind of wish, now, he was pregnant," she added wistfully. The more she asked, the more confusing the answers became. "Then they told me Oct. 17th was when he was actually canceled. But on Oct. 25 he had chemo, and they paid for it. So, I am getting different stories." Police officer makes too much money? The latest story? It's one that strikes the wife of a small town police officer as hard to believe. "Now, the new story with CHIP is they called and said my husband makes too much money, $173 too much. So, I'm very upset. I was bawling on the phone with her and the only thing she said was, 'Have a nice day,' and she hung up." "That was so upsetting, I couldn't believe it. I was trying to talk to her to figure out what was going on. My husband had overtime. He's a police officer. They're shorthanded. And so, he has to fill in when he can so he can protect our little bitty town of Gainesville." WND restated the question to make sure the facts were straight, asking: "Your husband has a police officer's salary and your insurance company is telling you that now, under the new insurance rules once Obamacare went into effect, he makes too much money for them to cover your child's chemotherapy. Is that correct?" "Yes, sir," Krista replied with the gentle politeness of someone raised in the heartland. She described how the woman on the phone told her, for a family of four, the Alford's had too much income to qualify. Krista informed the woman the CHIP website showed a higher amount and, therefore, the family did qualify. Krista said the representative simply replied, "No." So, the mother informed her, "Then you need to change your chart on your website, because that's what it's showing." Krista fought the medical bureaucracy with the tenacity of a mother whose child's life is literally at stake. "She told me, 'I guess you misread it. Or you misunderstood it.' No, I didn't misunderstand it. I am trying to do what's best for my child, and if they would have sent me a notice saying, 'Hey you need to requalify,' I would've been right on top of it because it is my son who needs this." Exasperation creeping into her soft but firm voice, Krista described how Hunter's disease is not only uncommon, so is the way it is behaving. "These tumors are very rare. They are not supposed to spread, but his decided they were going to spread. And it can go into his lungs, because the tumors like soft tissue, and your lungs are soft tissue." If Hunter is in the hospital now without any insurance, WND asked, how would the Alfords pay for his treatment? "We will be receiving a bill for it." The Alfords appear to be the kind of humble and self-sufficient Americans who would be too proud to ask for help. But their son's life is at stake. WND asked, how can people help? "People are donating money. There's a website 'Heroes for Hunter.' People have been so gracious by donating and I know it's so hard, it's around Christmas time. Since the story aired on (local television station) KXII donations went from only $1,000 to $10,000." 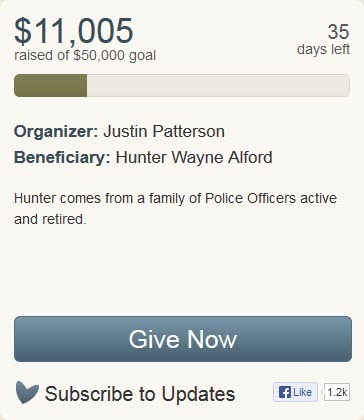 As of Wednesday, the website had raised $11,000 toward the $50,000 goal. Speaking barely above a whisper, Krista had to stop a few times to compose herself, but she managed to say: "It brings tears to my eyes. It warms me that people are donating their hard-earned money to help my family." Then she made a special request. Krista asked WND readers for something more important than money. "If you don't mind, would you say a prayer for my son? Prayers have been helping," she said. "I want to be able to go home for Thanksgiving and find him not running any more fevers. They really do help. " After a long pause, the exhausted mother collected her breath and continued: "He's not having a good day today. He's very grumpy." Asked about her plans for Thanksgiving, Krista said: "My family is going to try to come up here. They'll be bringing Thanksgiving to us. We'll have our own little Thanksgiving in Hunter's room." WND received late word that since speaking with Krista, Hunter is doing well and will be home for the holiday. Concerned individuals may contribute to the Heroes for Hunter fund. Concerned individuals may contact Texas Health and Human Services ombudsman using the online submission form or by calling (877)787-8999. To send a message to Hunter visit the Angels for Hunter website. To send a message to the president go to the White House website. Or, contact your member of Congress or senator.